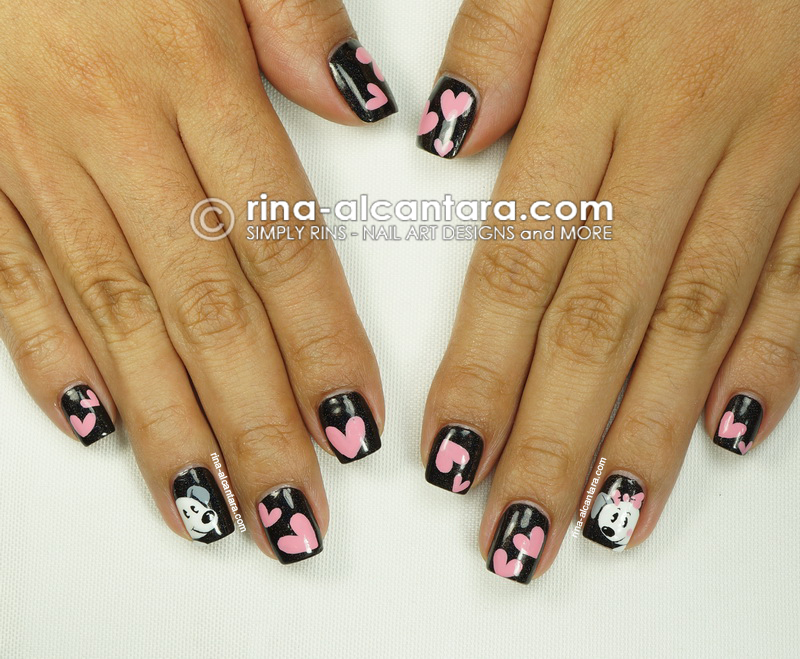 If you're a dog lover like myself, I'll bet you'll love this Valentine's nail art. And knowing that I am not a pink girl, this nail design definitely shouts pink. I was aiming for cute and fun and hopefully I was able to achieve that. Please forgive me for showering you with lots of hearts lately. These past few weeks has been all about love. Well, talk of it with friends is a more specific way to put it. And being single makes me want to keep painting my nails with hearts to remind me that perhaps, I'll find my one true love ... eventually. Okay, enough about that and onto the nails! I was wearing a black polish for about 2 days when I thought of using it as base for a Valentine's inspired nail art. My first thought was to create something abstract. But then I suddenly thought of "puppy love". Yes, it was out of the blue. And it made a great idea for a nail design. The base I used is 2 coats of the lovely Glitter Gal Black. What makes this polish stunning are the rainbow shimmers. I absolutely love it. Formula was great and applying it is a breeze. If you love black and it would like to wear the color with some bonus, you could probably try this one. This is a hand painted nail art done with acrylic paints and a detailing nail art brush. My idea is to paint a male and female puppy and surround them with hearts to achieve that "puppy love" theme. Initially, I wanted to paint the puppies on 2 nails that are side by side. I guess that would have made this design more obvious. But I decided to have an accent on both hands. I placed the female pup on my left hand and the male one on my right hand. I then added some pink hearts on all the other nails. I think I overdid the hearts in a way that they took the limelight off the puppies. Do you think so, too? I think it would have been better if I only added a few small hearts. Or perhaps if I changed the background of the accent nail, where the puppies were painted, this design would have been better. For the girl doggy, I added a pink ribbon and a blush on her cheek. An alternative is to paint the ribbon with a different color so that it would be more noticeable since the hearts on the other nails are already pink. I just had to add a blush for cuteness! I think they look adorable and this Valentine's nail art brings me back to my teen years. You know, once in awhile, I find it refreshing to wear something like this even if others might feel that it's beyond my age. Cartooning has always been my first love and to create something like this is like hitting 2 birds with one stone -- my passion for cartooning and nail art painting! So cute! You do a wonderfull job freehanding. You never fail Rins. They are just cute, adorable and lovely. Makes me wanna snuggle with your nails. hahaha!